The Ideal-Lume Standard LED has a 5 year warranty on the fixture and dimmer. The fixture is extruded aluminum and designed in the USA. 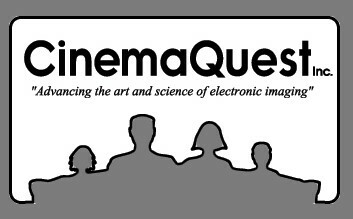 It is linkable with optional link cables. A frosted diffuser lens is included. It has a side-mounted on/off rocker-switch; 2 meter grounded power cord;grounded plug adapter included; included electric, plug-in dimmer; expanded mounting hardware kit; ETL safety approved. 120 volt, 50/60 Hz; Color: Black; Size: L23.5" x W1" x H1.5"; 6500K, 93 C.R.I., 50,000 hour (average), 7 Watt. 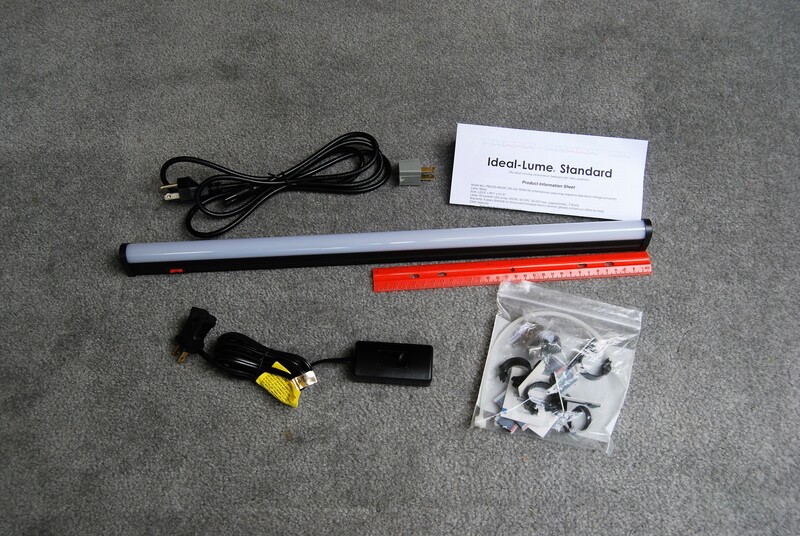 Includes: one Ideal-Lume Standard LED fixture, one mounting hardware packet, one LED one-meter linking cable, but no power cord, no dimmer, no product information sheets. For wall-mounted flat panel TVs, 6500K, 93 CRI, 50,000 hour life (average), 7 Watt x 2, 5 year warranty, one power cord, one dimmer, linkable with single one-meter linking cable included. This model uses the same LED fixture as the Standard LED model. 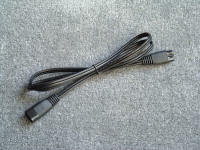 This optional cable is used for linking LED fixtures together. It's 1 meter long (39 3/8") and can be interconnected for longer distances, since the two ends mate together. The Ideal-Lume Pro LED has a 5 year warranty on the fixture and dimmer. A plug-in electric dimmer control is included. The custom fixture is designed in the USA, and the custom CIE D65 LEDs have best-in-class spectral power distribution. It has a frosted diffuser lens; 2 meter grounded power cord; grounded plug adapter included; expanded mounting hardware pack; ETL safety approved. 120 volt, 50/60 Hz; Color: Black; Size: L23.5" x W1" x H1.5" CIE D65 SPD; 97 C.R.I., 50,000 hour (average), 7 Watt. 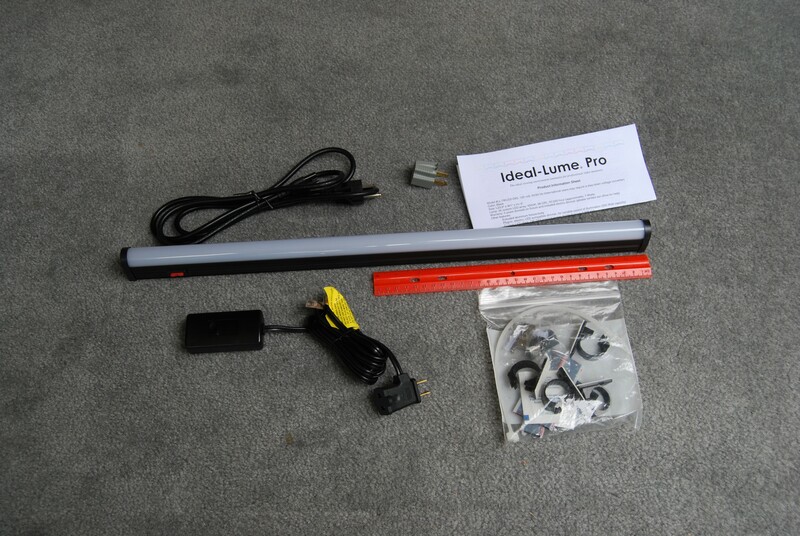 Contact us directly if you wish to expedite your method of shipping for the Ideal-Lume Pro LED. Includes: one Ideal-Lume Professional LED fixture, one mounting hardware packet, one LED one-meter linking cable, but no power cord, no dimmer, no product information sheets. The Ideal-Lume Standard has a 1 year warranty. 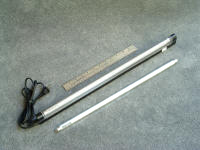 The fixture is assembled in the USA; Clear, acrylic, wrap-around diffuser; Permanent rotating mechanical baffle tube for regulating the light output; Side-mounted on/off rocker switch; high-frequency electronic ballast for instant start, quiet, energy-efficient operation; 6 ft. power cord with polarized plug; Mounting kit with screws, drywall anchors, nylon cable ties, and high-temperature, industrial, self-stick Velcro; UL and C-UL listed. 120 volt, 60 Hz; Color: Black; Size: L22" x W7/8" x H1 3/4"; lamp(x2): 6500K, 90 C.R.I., 10,000 hour (average), T5 fluorescent, 20 1/4" long, 13 Watt. 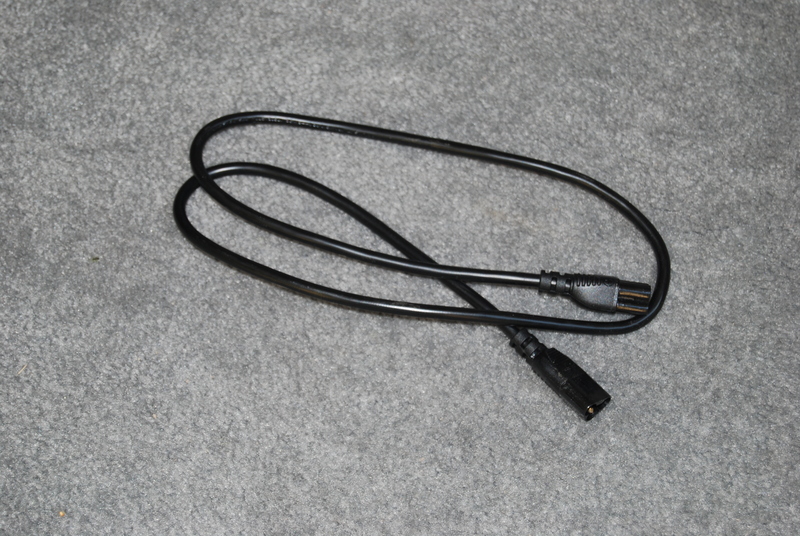 Same features as the US model with ungrounded, two round pins, NW-4C type power plug. The Ideal-Lume Panelight has a 1 year warranty. 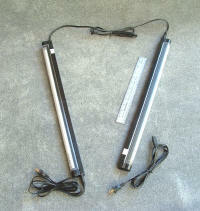 Dual fixtures for bi-directional illumination; Ultra slim design for placement behind wall-mounted, flat panel displays; Simple, variable baffle tubes included for precise and varied control of the illumination; Assembled in the USA; Side-mounted on/off rocker switch; High-frequency electronic ballast for instant start, quiet, energy-efficient operation; Clear, acrylic, wrap-around diffuser; 6 ft. power cord with polarized plug; two 1 meter linking cords for joining the two fixtures; Joining adapter for connecting two fixtures end to end; Mounting kit with screws, drywall anchors, nylon cable ties, and high-temperature, industrial, self-stick Velcro; UL and C-UL listed. Same features as the US model with ungrounded, two round pins, NW-4C type power plugs. This optional cable is used for linking T5 fluorescent fixtures together. It's 1 meter long (39 3/8") and can be ganged together for longer distances, since the two ends mate together.